A 66-year-old female with a history of atrial fibrillation, hypertension, and diabetes presented to the emergency department with chest pain and shortness of breath. Laboratory analysis including CBC, CMP and D-Dimer were unremarkable. Brief physical examination revealed lungs which were clear to auscultation bilaterally, regular heart rate and rhythm without murmur and a soft non-tender abdomen without evidence of ascites. During her initial evaluation, the emergency department team elected to perform a CT pulmonary angiogram (CTPA) due to patient’s complaints of chest pain and shortness of breath and history of prolonged immobility to evaluate for pulmonary embolus. No evidence of pulmonary embolism was identified to a sub-segmental level. 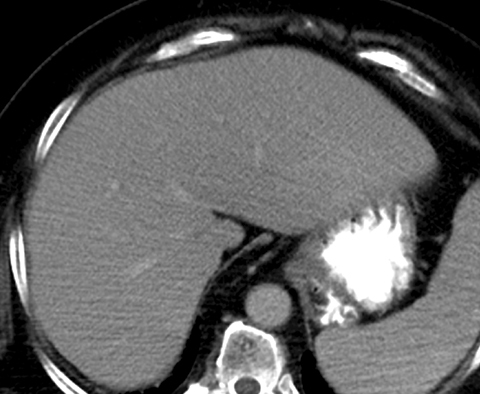 However, apparent morphologic changes of cirrhosis of the liver were noted incidentally (Figure 1). These findings were new when compared to a CT of the abdomen and pelvis performed just two weeks prior (Figure 2). 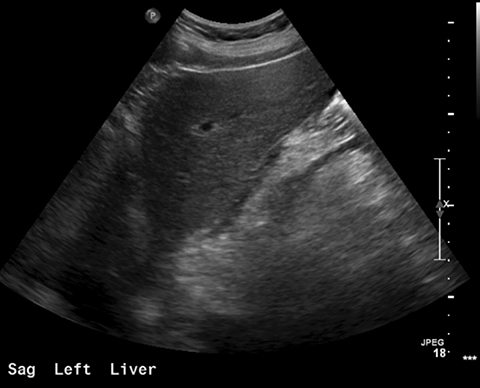 A follow-up liver ultrasound revealed no sonographic evidence of cirrhosis (Figures 3 and 4). Minimizing radiation dose to patients is an important factor to consider when optimizing computed tomography protocols. However, the benefits of radiation dose reduction must be carefully weighed against the ultimate goal of achieving a diagnostic quality examination. A known disadvantage of dose reduction is image quality degradation due to increased image noise from quantum mottle.1 CTPA and low dose screening chest CT are examples of examinations that accomplish diagnostic goals with aggressive dose modification.2,3 The success of these low dose examinations utilizes advances in contrast media injection and the inherent contrast of aerated lung. Unfortunately, dedicated imaging of abdominal organs often depends upon discerning subtle differences in attenuation, which is hampered by decreases in radiation dose and subsequent increases in image noise. We have observed the nodular contour of the liver classically described in patients with hepatic cirrhosis on a large number of patients undergoing CTPA with aggressive dose modification. Follow up with other imaging modalities revealed no evidence of hepatic pathology. 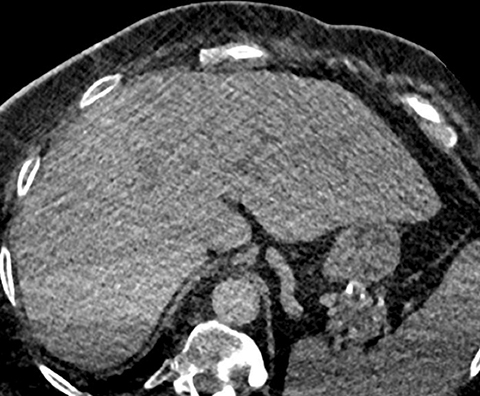 Currently, there is no description in the literature of dose reduction techniques leading to the misdiagnosis of liver cirrhosis. In order to increase awareness of this diagnostic pitfall and due to the rapidly evolving use of low dose techniques, it is important to continue to explore and understand both their limits and advantages. This case demonstrates the false appearance of a cirrhotic liver based on its macronodular surface and heterogeneous parenchyma. 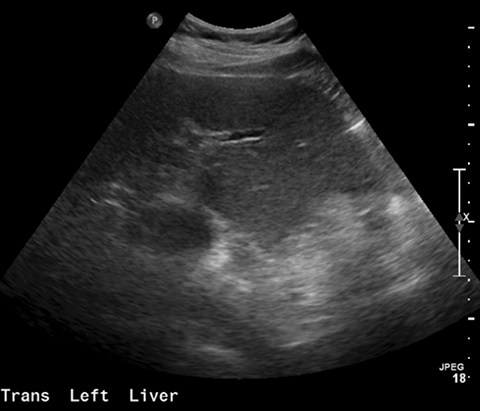 Comparison studies on ultrasound and CT without employing low dose techniques demonstrate a normal liver contour. Without prior knowledge of this phenomenon, the interpreting radiologist is more likely to incorrectly diagnosis cirrhosis. Hedrick WR. Effect of quantum mottle on radiographic image quality. Radiologic Technology. May 1, 1996. Szucs-Farkas et al. Diagnostic accuracy of computed tomography pulmonary angiography with reduced radiation and contrast material dose: a prospective randomized clinical trial. Invest. Radiol. 2014 April;49(4):201-208. Aberle DR, Adams AM, Berg CD, Black WC, Clapp JD, Fagerstrom RM, et al; National Lung Screening Trial Research Team. Reduced lung-cancer mortality with low-dose computed tomographic screening. N Engl J Med. 2011;365:395-409. Salinas CA, Krishnaraj A, Norton PT, Hanley M. Pseudocirrhosis due to aggressive dose reduction techniques. Appl Radiol. 2016;45(11):44-46. Prepared by Dr. Salinas while a Radiology Resident; Dr. Krishnaraj while an Assistant Professor of Radiology, Division Chief Body Imaging; Dr. Norton while an Assistant Professor of Radiology, Division of Noninvasive Cardiovascular Imaging; and Dr. Hanley while an Assistant Professor of Radiology, Section Chief Thoracic Imaging at the University of Virginia, Charlottesville, VA.